In-between the many things your personal reporter Angelique van Campen does on my iMac on a daily base, is trying to find some time to visit SFD EDDM and preparing herself to start with the Short Final Design EDDM review. Today, Saturday February 2nd, she found some time to switch the SFD EDDM scenery to Winter. Since she don’t own TerraMAXX, she switched manually to Winter textures. Although it’s described in the user manual, but also very easy to do it with the following guidance. In the root of the EDDM main folder (ShortFinal – EDDM – Munich Airport) you find two library.txt files. One if named as expected “library.txt” while the other is named “library_Winter.txt”. Rename the original library.txt to for example library_default.txt and the other library_Winter.txt to library.txt which means that this will be then the active library text file. After that, restart X-Plane and you’re in Winter wonder world, but there’s also a kind of downside with this. That downside has nothing to do with the SFD EDDM airport scenery, but with the X-Plane default scenery. As we all know, X-Plane doesn’t now the seasons of the year. That said, everything that belongs to the SFD EDDM is transformed into Winter thus Winter textures. Everything outside the SFD EDDM parameter is still green or season-less. Read the whole story and see it all at our exclusive Winter wonder world screenshots page. 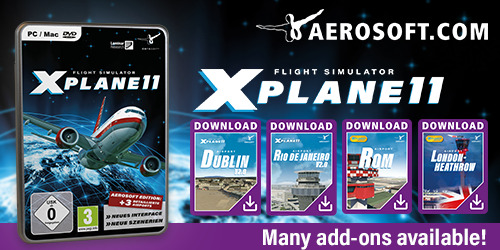 MisterX6 recommended this free plugin https://forums.x-plane.org/index.php?/files/file/46982-seasons-winter-xp11/ to me. Downloaded, installed, Library in EDDM swapped, dates in Seasons-Winter library files edited. Simple installation, straightforward editing, beautiful result on my iMac. Oh… yes, I forgot, you are on a mac. I don’t know if the JSGME tool works with your OS but the winter packages could be copied in manually, they have the folder needed structure included. The only thing to think about with a manual installation is creating backups of the original files for reverting back later. Winter mods installation and switching with JSGME is really easy and many designers seem to provide winter packages for their sceneries so I think it’s worth a try. Hi Agnes, thank you for taking the time to comment to this post. Definitely worth to give it a try. I only hope it’s not only for Windows since I’m a Mac simmer. Anyway, when I can’t use it then I hope other will read this and try it out.